First published in Mosaic Magazine, August 26, 2014. Berating Jews with their own history, disinheriting them of pity, as though pity is negotiable or has a sell-by date, is the latest species of Holocaust denial. . . . Instead of saying the Holocaust didn’t happen, the modern sophisticated denier accepts the event in all its terrible enormity, only to accuse the Jews of trying to profit from it, either in the form of moral blackmail or downright territorial theft. According to this thinking, the Jews have betrayed the Holocaust and become unworthy of it, the true heirs to their suffering being the Palestinians. Experts call this Holocaust inversion. Based in the claim that Israel now behaves toward the Palestinians as Nazi Germany behaved toward the Jews, it originated in post-World War II Soviet propaganda, and from there spread to the Soviets’ Arab clients. It is now fully embedded in the Arab-Muslim world, where it grows and mutates in symbiosis with outright denial that the Holocaust occurred or a radical reduction of its genocidal scale, ferocity, and number of victims. Holocaust inversion has a graphic omnipresence in cartoons all over the Arab and Iranian press, where Israelis are regularly portrayed in Nazi regalia. Elsewhere in the Middle East and beyond, it has surfaced in the rhetoric of populist demagogues and the media. In Turkey’s new president and long-time prime minister, Recep Tayyip Erdogan, it now has a champion in a head of state. In Europe, Holocaust inversion is busy spreading beyond its original locus of infection and finding a home among intellectuals and activists, especially on the Left. Thankfully, the disease is still rather hard to find in America, where it festers in only a few dark places. Some of those places, regrettably, operate as institutions of higher learning, and in one of them—Columbia University—a number of professors, mainly instructors in Middle East studies, have distinguished themselves in the black art of defaming Israel as a Holocaust emulator. Only a decade ago, Columbia was compelled to investigate departmental instructors who had been accused of intimidating their students with extreme anti-Israel diatribes. Not only did the university absolve its professors, however, it even granted tenure to the one faculty member against whom its own investigators found a student’s claims to be “credible.” Encouraged by this green light, the extremists have been tunneling under Morningside Heights ever since, fortifying their positions and waiting for a signal to emerge firing. Half a century of systematic maiming and murdering of another people has left its deep marks on the faces of these people, the way they talk, the way they walk, the way they handle objects, the way they greet each other, the way they look at the world. There is an endemic prevarication to this machinery, a vulgarity of character that is bone-deep and structural to the skeletal vertebrae of its culture. Once again, there is the conflation of Israel with “murder”—and not just murder but, in a new step for Dabashi, a “sustained murderous history” that has finally achieved Holocaust-class status: in Gaza, he writes, Israel has created an Auschwitz. As a “historical fact,” the real Auschwitz—the one where 500 totally innocent Jews perished for every single innocent or guilty Palestinian killed in Israel’s recent operation—is now merely “archival.” Now, the world’s most infamous death camp has become a “metaphor” for a place where, as it just so happens, the population grows by almost three percent per year. Such is the abyss of ignorance, bigotry, and casual mendacity inhabited by Columbia’s chaired professor of Iranian studies and comparative literature. Next up is Joseph Massad, associate professor of modern Arab politics and intellectual history and the man who, having compiled the clearest record of classroom intimidation at the very time he was being considered for promotion to permanent faculty status, stood at the center of the last Columbia scandal. Then, in his struggle for academic survival, Massad had protested to the university’s investigating committee that the “lie . . . claiming that I would equate Israel with Nazi Germany”—the essence of one student accusation—“is abhorrent. 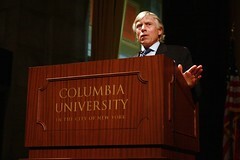 I have never made such a reprehensible equation.” In a moment that won’t be remembered as Columbia’s finest, President Lee Bollinger and his board, succumbing to the bullying of radical faculty members, granted him tenure. By 2009, after another Gaza flare-up, Massad no longer had any need for dissimulation. The professor who had found “reprehensible” the equation of Israel with Nazi Germany published an article entitled “The Gaza Ghetto Uprising.” Illustrated by the famous image of a surrendering child in the Warsaw ghetto, the article invoked an alleged Israeli plan to “make Israel a purely Jewish state that is Palästinener-rein,” and characterized the Palestinian Authority—or, rather, “the Israeli-created Palestinian Collaborationist Authority”—as “the judenrat, the Nazi equivalent” in this scenario. Al Jazeera ran a pathetic response by an American Jewish critic of Israel who scolded the author for damaging the Palestinian cause. Last year, Massad penned another effort, “The Last of the Semites,” carrying the equation back in time. It was, he, postulated, their “shared goal of expelling Jews from Europe as a separate unassimilable race that created the affinity between Nazis and Zionists all along.” Massad ended the article by anointing the Palestinians as the true “heirs” of the pre-Holocaust Jewish struggle against anti-Semitism. So great was the revulsion caused by this piece of Holocaust inversion that its publisher, Al Jazeera, pulled it for a time. There’s an irony here, and a tragic one. During Columbia’s investigation of the complaints against him, Massad was most vigorously defended by an unlikely student supporter, who once showed up on campus in a sandwich board inscribed “I served in the Israeli army. I love Massad.” The student, who insisted that “nobody calls me a baby-killer when I go to office hours,” later committed suicide, and is memorialized at Columbia through a summer travel scholarship for students in the Middle East program. With Massad’s own airing of the “baby-killer” canard, the professor has now betrayed the ghost of his most ardent Jewish defender. An example of this trend [they write] is a growing use of the word “ghetto,” a term associated directly (but in no way exclusively) with the Holocaust to describe the Gaza Strip. . . . While [Rashid] Khalidi does not directly compare the Gaza violence to the Holocaust (he uses the examples of Belfast and Soweto), the image of a fighting ghetto is strongly associated with the Warsaw ghetto. Indeed, a few days after his article appeared, Khalidi confirmed just which ghetto he meant by denouncing “the siege, the blockade, the starvation of these people” in Gaza. The Nazis did indeed starve the Warsaw ghetto, and famine killed thousands. But not a soul has died of starvation in Gaza, and if stunted growth in childhood is a measure of poor nutrition, Gaza’s rate is lower than that of any Arab state but Qatar. Philip Gourevitch, also writing in the New Yorker, characterized Khalidi’s ghetto-referencing piece as an instance of “magical thinking.” He was being charitable. Beyond these three cases, another Columbia-related episode is worth noting. Probably the cleverest of the anti-Israel lot on Morningside Heights is Nadia Abu El-Haj, associate professor of anthropology at Barnard College. A few years back, she, too, won a bruising tenure battle. But in her case, the outcome was never in doubt because (unlike Massad) she trod lightly. “I’m not a public intellectual,” she said at the time. “I’m drawn to archives, to disciplines where the evidence sits for a while. I don’t court controversy.” This, despite the fact that her entire “academic” project is aimed at casting Zionism as the fabrication of a totally specious national identity. “Israel is a settler-nation,” she writes, “that is, a project of European colonial settlement that imagined and believed itself to be a project of national return.” Those deceiving Zionists—they even duped themselves into thinking they were going home! The IDF’s tactics [in Gaza] recall the logic of the British and American firebombing of German and Japanese cities during World War II: target the civilian population. Make them pay an unbearable price. Then they will turn against their own regime. When Israel attacks hospitals in Gaza, when it wipes out extended families, when it mows down children running on a beach, it is engaged in a premeditated act. No Auschwitz or Warsaw ghetto for Abu El-Haj. But Dresden and Tokyo—why not? So what if Israel, unlike the Allies in World War II, warns civilians of impending strikes and, again unlike the Allies, eschews area bombardment and incendiary bombs? So what if one night of bombing over Tokyo killed 50 times as many as Israel’s month-long campaign in Gaza? Clearly, the Statutes of the University accord the Trustees and the President as their delegate almost total power on all aspects of governance including the granting of promotion and tenure to faculty. However, a reading of the Statutes should not close the subject. The question remains, under what circumstances, if any, should the President and the Trustees exercise these statutory powers. Decisions on matters as important as tenure and faculty promotion have… been made at Columbia over the last fifty or so years at the level of the Provost with the advice of faculty, without the intervention of the President and Trustees, and were passed on to the President and Trustees for formal approval under the Statutes. The President has to be involved and is involved in promotions and decisions with respect to tenure. It is an aspect of his responsibility that he takes very seriously. So do the Trustees. The President continued that he concedes that by custom we operate in a very special way. It is indeed rare for the President or the Board of Trustees to reverse or overturn a decision that comes to them through the faculty, deans, and Provost. Deference that is paid to judgments made at lower levels is exceedingly important to the values of this institution. An extraordinary amount of deference is given to individual faculty, individual departments, and schools in defining their research and curricular agendas, and so it should be. It would however be a big mistake and incorrect as a matter of structural fact to think in the way that Professor Nathan is suggesting. Massad is perfectly aware of university statutes. When he told friends he’d already been tenured, it wasn’t a mistake on his part, or a case of jumping the gun. It was a statement: Massad does not recognize the authority of the trustees to deny him tenure. This is the position of many of the Faculty of Arts and Sciences, who in May 2006 published their own statement on academic freedom. In it they expressed their view that “[tenure] decisions are, by University statute, subject to review and approval by the trustees, whose customary deference to faculty in academic matters has been essential to the University’s success.” In other words, in the opinion of these faculty, trustees should only review and approve their decisions, and never overturn them. But it’s the trustees who have the statutes on their side. They are “academic officers” of the university, and if any of them do not take “very seriously” their role in tenure decisions, they shouldn’t be on the board. Bollinger has defended their authority to veto the faculty in “rare” and “extreme cases,” and if Massad isn’t an extreme case, who is? I was disappointed that Bollinger himself didn’t nix Massad’s tenure. But it might have been too much to expect from one man, even Columbia’s president. He already faces a campaign of intimidation by faculty extremists, who think the job of the president is to defend their excesses. They’ve got a faculty letter going, demanding that Bollinger denounce Israel for allegedly violating Palestinian academic freedom. (To that end, they also held a media-free conclave on Thursday night.) Bollinger has told them to forget it, and I don’t think he need lose any sleep. Still, an argument can be made that as between Bollinger and the trustees, it is the trustees who should assume (and share among them) the burden of doing what must be done to save Columbia’s name. The statutes empower them to do so, and Bollinger has defended their prerogative. They should not be timid. The larger part of the Columbia community—faculty, students, donors, and alumni like myself—would be grateful for a show of courage, by those who hold the university in trust. The New York Post features an article by Jacob Gershman on the Joseph Massad tenure case at Columbia. I highly recommend it. Gershman covered this story for the now-defunct New York Sun, and he knows all the ins and outs. Columbia’s trustees must decide: Do they attempt to clean up after Bollinger and stop this absurdity—or do they confer academic legitimacy on Massad’s ideas and agenda? Hesitant to insert themselves in an academic matter, the trustees would be wise to consider the consequences of silence. For Massad, of course, Columbia’s trustees are just a rubber stamp. This is why he’s been telling his friends he’s been tenured, even though tenure is only conferred by the Board of Trustees. Rubber-stamping may be the usual role of the Columbia’s trustees in tenure decisions. But I’m also sure that whoever invented the system also imagined that one day there might arise an exceptional case, compelling the trustees to veto a recommendation. If not, why require their approval at all? If so, Massad is that once-in-a-generation case. An attack on my scholarship therefore is not only an attack on me and on MEALAC [his department at Columbia] but on Columbia’s political science department [which graduated him], [and] on prestigious academic presses, including Columbia University Press [which published his thesis]… an opinion expressed by Martin Kramer who also condemns Middle East Studies at Columbia. So is Miron about to be vindicated? Is “Columbia not courageous enough”? The question now boils down to this: does any courage reside in the Board of Trustees? Or have they been carefully inbred as well, for passivity and acquiescence? We shall see. Too late to stop Massad? Isn’t it too late to stop tenure for Joseph Massad? This question has been posed to me by a reader, in light of the claim by Massad (via the Angry Arab) that he’s already been tenured. There’s no way for someone outside the system to know for certain where the process stands. But we do know this: when the Columbia Spectator sought to confirm the rumor launched by Massad via his friend, it found it to be false. The Spectator called it “chatter,” and added this: “The outcome of the controversial Palestinian scholar’s tenure process remains to be seen and the review has not concluded.” (My emphasis.) The article goes on to explain the review process, which is also laid out in the Faculty Handbook. Once the ad hoc tenure committee has made a recommendation to the Provost, the department chair must inform the candidate of that recommendation. But a favorable recommendation still must be approved by the Provost and the President, before presentation to the Board of Trustees. The ad hoc committee only serves in an advisory capacity to the Provost. The key word here is “usually.” Indeed, the Faculty Handbook describes as “unusual cases” those instances in which the Provost, President, or Trustees overrule a favorable recommendation by an ad hoc committee. But just how unusual are they? For the period between 1989 and 1997, we know the answer to that question, because Columbia’s then-Provost Jonathan R. Cole went before the Faculty Senate to review the statistics of all the tenure decisions made between those dates. He revealed that there had been 304 ad hoc reviews during the eight-year period, 38 of which ended in tenure denial. The Provost was responsible for 14 of the 38 denials, having overruled favorable committee recommendations. Put another way, ad hoc committees made 280 positive recommendations, and the Provost (Cole during the entire period) rejected 14 of them—a rejection rate of exactly five percent. So rejections of favorable committee recommendations, while “unusual,” weren’t unprecedented or even rare in Cole’s time. Indeed, overruling by the Provost appears to be a routine method of tenure denial: in the period reported by Cole, 37 percent of all tenure denials after full review constituted cases of the Provost overruling an ad hoc committee. Massad’s case is unusual by any reckoning, and would be treated with additional scrutiny by the Provost. But even if the Provost were to recommend tenure, this wouldn’t absolve President Bollinger of his personal responsibility. The Faculty Handbook stipulates: “Upon completion of his or her review, the Provost will submit a recommendation to the President on whether the candidate should be awarded tenure. A nomination is forwarded to the Trustees for their approval only if the Provost and President are satisfied that the candidate deserves tenure.” Massad cannot be tenured unless President Bollinger is satisfied that he deserves it—and, presumably, tells the Trustees why. To set aside one’s pre-existing beliefs, to hold simultaneously in one’s mind multiple angles of seeing things, to actually allow yourself seemingly to believe another view as you consider it—these are the kind of intellectual qualities that characterize the very best faculty and students I have known and that suffuse the academic atmosphere at its best. Joseph Massad hasn’t a single one of these qualities. If President Bollinger notifies the trustees that he’s satisfied that Massad deserves tenure—something he must know to be untrue—it will be a devastating admission of failure—his and the university’s. Now we shall learn how much courage resides in Low Memorial Library. Footnote: Read this damning new compendium of the wisdom of Massad. President Bollinger’s contact information is here. West Bank-based Palestinian intellectuals, like their liberal counterparts across the Arab world, have been active in the last several years in demonizing Hamas as the force of darkness in the region. These intellectuals (among whom liberal secular Christians, sometimes referred to derisively in Ramallah circles as “the Christian Democratic Party,” are disproportionately represented) are mostly horrified that if Hamas came to power, it would ban alcohol. Assuming Hamas would enact such a regulation on the entire population were it to rule a liberated Palestine in some undetermined future, these intellectuals are the kind of intellectuals who prefer an assured collaborating dictatorship with a glass of scotch to a potentially resisting democracy without…. The journey of West Bank liberal intellectuals, it seems has finally come to this: after being instrumental in selling out the rights of Palestinians in Israel to full equal citizenship by acquiescing to Israel’s demand to be recognized as a racist Jewish state, and the rights of the diaspora and refugees to return, they have now sold out the rights of Palestinians in Gaza to food and electricity, and all of this so that the West Bank can be ruled by a collaborationist authority that allows them open access to Johnny Walker Black Label (their drink of choice, although some have switched to Chivas more recently). In this context, how could Israel be anything but a friend and ally who is making sure Hamas will never get to ban whiskey? This isn’t tongue-in-cheek. That’s it—the sum of Massad’s political analysis of why, in Ramallah, there’s no desire to fall into the grip of Hamas and its “resisting democracy.” Massad’s approach is always the same: caricature and dehumanize anyone who won’t kill and be killed to destroy Israel—even (and especially) if they’re Palestinians and their sympathizers. Massad once even claimed that the regret over Gaza’s secession expressed by the late Palestinian poet Mahmud Darwish “can be explained by the monthly checks [Darwish] receives from the Fatah-controlled Palestinian Authority.” If it’s not booze, it’s cash. A bit reductive, even for Columbia. And what of Professor Massad? When the New York Times visited him at home in Manhattan to profile the armchair resister, it reported that the reading material on his coffee table was The World Atlas of Wine. “His elaborate freestanding Egyptian water pipe is stoked with apple-flavored tobacco as a weekend indulgence, accompanied by Cognac, after dinner parties.” How ennobling it is to champion Hamas—from a safe distance.